There are two sections. The first contains Papers & Presentations specific to metadata, the PBCore, and Public Broadcasting. The second lists various Resources & Links related to metadata standards and guidelines. As PBCore finds itself used in a multitude of settings, databases, media information systems, and organizations, it is appropriate to "Re-Reconnoiter" with the Public Broadcasting Metadata Dictionary, particularly with regard to the American Archive Pilot Project (AAPP). At the September 2009 conference, hosted by Oregon Public Broadcasting, PBCore is re-visited, highlighting its origins, its purpose, how it can be applied, and what could be considered better practices in the use and abuse of metadata descriptions. ... to serve as a digital repository of content produced by public television and radio, and is designed to be used by the general public, educators, broadcasters and historians. It is both preservation and a distribution system, which shares the public service orientation and sensibility of the public broadcasting system. The AAPP is a pilot project to develop a subset of historically relevant digitized television and radio content. The goal of the project is to help CPB identify the challenges and issues encountered in the digitization of public broadcasting content as it relates to the implementation of the full Archive, which could ultimately involve scores of thousands of hours of content – both programs and back up material – reaching back as many as seven decades. Certainly metadata plays a pivotal role. In a Re-Reconnoiter of PBCore, Paul Burrows (Media Solutions, University of Utah) recalls the genesis of the metadata dictionary and joins with the participants in exploring how its well-researched and well-defined metadata elements can be applied in describing media items and in sharing those descriptions between different information systems. CURRENT Article December 17, 2007: "Get Going in Metadata Today with this Amazing Free Kit!" New training opportunities for PBCore, both online and on-demand, were announced. As well, a call-to-action to participate in PBCore's Community of Practice by joining the Listserv. At the 2007 conference of the National Educational Telecommunications Association (NETA)(January 25-28), the new release of PBCore Version 1.1 was highlighted in a presentation by Paul E. Burrows reviewing the current activities of the PBCore Project. Attendees were updated on the advocacy, promotion, and adoption engagements of PBCore with industry groups, national and local program producers, PBS, NPR, Content Depot, and vendors of traffic and scheduling software. With version 1.0 of the PBCore metadata dictionary published via its website (http://www.pbcore.org), the project has moved into a new phase. Through the next 18-months, funded by CPB and managed by NCAM, the National Center for Accessible Media, PBCore will aggressively engage in advocacy, training, implementation, and support activites in order to build a "Community of Practice" for the dictionary and its adoption by users, vendors, and standards groups. The XSD (XML Schema Definition) for the PBCore metadata dictionary is available in draft form and is ready for comment from interested parties. The schema is available in both pdf and Word doc (zipped) formats. There is a need to express the PBCore dictionary elements and definitions in a concise and structured manner to enable integration and interoperability across multiple systems. The PBCore XML Schema builds on the entire PBCore effort to date and takes this step. This document attempts to provide background rationale and discussion, along with the complete PBCore XML Schema and an example PBCore asset document (record). At the 2005 PBS Technology Conference in Las Vegas, Nevada, Dennis Haarsager provided an update in activities and a progress report of the Public Broadcasting Metadata Dictionary Project. At the 2005 PBS Technology Conference in Las Vegas, Nevada, Paul E. Burrows shared an overview of the newly published PBCore Metadata Dictionary, v1.0. At the 2005 annual conference of the National Educational Telecommunications Association in the eMedia track on metadata fundamentals and digital asset management, attendees were updated on the status and future agendas of the Working Group of the Public Broadcasting Metadata Dictionary Project and the PBCore. As the PBCore approached official publication in the late Autumn of 2004, its history, applications, metadata elements, web presence, and User Guide were reviewed for the attendees of the 2004 Iowa DTV Conference. This August version is an update to the April 2004 brochure, "Shhhh...It's time to listen to your inner librarian." It announces the launch of the PBCore Metadata Dictionary, version 1.0. 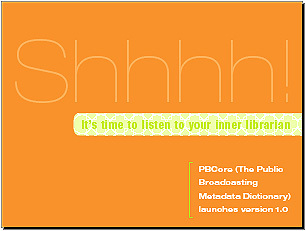 In this press release it is announced that the inaugural version of PBCore (Public Broadcasting Metadata Dictionary), a standard way to describe all public broadcasting content, has emerged from the Test Implementation phase and is being finalized for the launch of version 1.0 in September 2004. Under development since January 2002, PBCore is the result of unprecedented cross-organizational cooperation by a team of public radio and television producers and managers, archivists and information scientists. There was a sincere belief by all participants in the Test Implementation Phase that their organization, and public broadcasting at large, needs something like the PBCore to be widely available, and in use by a majority of public broadcasters, if they are going to be able to capitalize on opportunities in the future. These opportunities range from simple labor cost savings to new business opportunities. Also, because broadcasters have not had affordable Digital Asset Management solutions available to them, many have delayed acting to solve pressing problems related to storage and handling of their content, especially that material which is born digital and resides on production and broadcast servers. This delay created a situation where many broadcasters are in critical need for solutions that will enable them to share content with their production and distribution partners, as well as help ease the burden on their current digital production, broadcast, and archive systems. Beginning in January 2002 a team of public broadcasting station and national network representatives and invited guest experts worked to develop a draft metadata dictionary for public broadcasting. This effort, managed by WGBH/Boston under a grant from the Corporation for Public Broadcasting, resulted in a draft "Public Broadcasting Core Metadata Elements Dictionary" completed by the project's "Dictionary Team" in January of 2004. Controlled vocabulary "refinements" for each of the metadata elements were completed on February 27th and 28th. A preliminary survey of the "usefulness" of each of the PBCore Dictionary element definitions and refinements/vocabularies was conducted from February 4-10, 2004. Seventeen (17) members of the PBCore Dictionary Working Group were invited to participate; three (3) reviewed the survey questions and made general comments, and ten (10) members completed the full survey. A small group of nine (9) "metadata experts" from the library science, national standards, and media indexing and archivist communities extended their comments via an "open-ended" survey. They were also asked a number of questions relating to the "philosophy" of metadata schemas that could inform the work of the team asked to update and maintain the "PBCore." 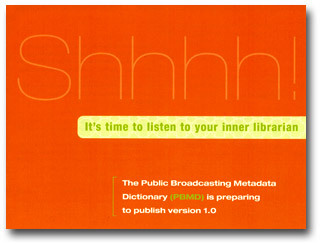 Distributed at the PBS Technology Conference in Las Vegas (2004) was a 4-page brochure announcing the impending publication of the PBMD Metadata Dictionary. The brochure is affectionately called "Shhhh...It's time to listen to your inner librarian." Presented at the 2004 PBS Technology Conference. Who has not heard the fable "The Blind Men and the Elephant," told by the Persian poet Jalãl al-Din Rümï (d 1273) or the derivative work it inspired by the American poet John Godfrey Saxe (1816-1887). The fable has been scraped and harvested to illustrate untold numbers of lessons and pearls of wisdom. Well, let's join in. None of us are probably blind to the challenges and opportunities for Public Broadcasting when faced with managing program data in the digital era. But we each describe the beast from unique, sometimes divergent, sometimes complementary, perspectives. This session recognized the vagaries and complexities of describing program data, rights usage, subject descriptions, and the information sharing that takes place as a program or project is released, distributed, and made ready for play-out to our audiences. 4th Public Broadcaster: "It's a pillar. I touched it." ...or "It's an Episode Title." 6th Public Broadcaster: "A sword, I say." ...or "It's a Series Title." 2nd Public Broadcaster: "A venomous snake." ...or "It's a National NOLA Code." 1st Public Broadcaster: "A bed." ...or "It's a Local NOLA Code." 3rd Public Broadcaster: "A rope." ...or "It's a Children's Program." 5th Public Broadcaster: "A beautiful fan!" ...or "It's a Docu-Drama-Newsy-Interview Type Thing." As part of the 2003 conference of the American Society for Information Science & Technology, the background, current issues, and future work of the Public Broadcasting Metadata Dictionary Project were reviewed by Paul Burrows (University of Utah) in a session on broadcasting metadata moderated by Efthimis Efthimiadis (University of Washington). Version 1 of the PB Core metadata was introduced and the objectives of newly formed task groups for the next phase of the project were summarized. As part of the 2003 Dublin Core Conference in Seattle, Washington, the PB Core was introduced by Efthimis Efthimiadis, University of Washington. A review of the metadata elements, v1, was provided, as well as discussions about the project's issues, challenges and next steps. Central to the session was the presentation of a formal paper submitted by the Metadata Project (see PDF link below). The paper summarizes the PB Core as the result of the public broadcasting Metadata Dictionary Project (PBMD Project), an effort of the public radio and television broadcasters to develop a schema for the description of their assets. PBMD Project is under the auspices of the Corporation for Public Broadcasting. The paper discusses the user-centered development of the schema, the elements of the PB Core, the application profile, and the feedback and evaluation process of the schema. At the final gathering of participants for the Evolving the Links series of conferences at the University of Wisconsin (http://evolvinglinks.uwex.edu/) Alison White (CPB), Marcia Brooks (WGBH), and Paul Burrows (KUED/Media Solutions/Univ of Utah) provided an update on the accomplishments, activities, and goals of the Public Broadcasting Metadata Dictionary Project. Three perspectives were reviewed with regard to the project: (1)Public Policy perspective, (2) Business Interests, and (3) Knowledge Sharing. The development and status of the PBCore Metadata Elements were presented, as well as long-term sustainability issues regarding the application of the PBCore. At the 2003 annual conference of the Integrated Media Association (iMa) Conference in Minneapolis, Minnesota, attendees were updated on the status and agendas of the Working Group of the Public Broadcasting Metadata Dictionary Project. At the 2003 annual meeting of the PBS Technical Conference in Las Vegas, Nevada, attendees were updated on the status and agendas of the Working Group of the Public Broadcasting Metadata Dictionary Project. At the 2003 annual conference of the National Educational Telecommunications Association in San Antonio, Texas, the concurrent session on "Getting Ready for Asset Management" updated the attendees on the status and future agendas of the Working Group of the Public Broadcasting Metadata Dictionary Project. At the 2002 annual conference of the American Society for Information Science and Technology in Philadelphia, Pennsylvania, members of the Working Group for the Public Broadcasting Metadata Dictionary Project presented background information about Public Broadcasting's interests in Media Asset Retrieval Systems and updates on the MARS Project as well as the latest news from the Public Broadcasting Metadata Dictionary Workgroup's activities. Youll shout 'Hallelujah' when you become enlightened about the new world of Digital Asset Management. CPBs media maven Alison White will spread the word(s) from the Metadata Dictionary Project. (Metadata is all the information about your valuable digital media assets and youll find out, you have more than you thought.) David MacCarn will deliver the gospel according to a new DAM model recently developed at WGBH in Boston. And Grace Agnew, Library of Congress & Association of Moving Image Archivists, will baptize you in the deep digital waters of organizing & storing your valuable media assets. At the WGBH Asset Management Symposium (September 26 and 27, 2002), Alison White, CPB, reviewed the objectives and activities of the Working Group for the Public Broadcasting Metadata Dictionary Project and discussed how the metadata core that emerges will impact the public broadcasting community. At the PBS Annual meeting for 2002, members of the Working Group for the Public Broadcasting Metadata Dictionary Project raised awareness of the project and advised the multi-disciplinary audience as to why the project's work is important to all. Building on Steven Vedro's original article "Why Metadata Matters," this piece (originally published in Current), poses a series of "Frequently Asked Questions" that public broadcasters are likely to ask themselves about the importance of metadata and Digital Asset Management (DAM) and their implications for local station operations. As part of the WGBH Educational Foundation's work in developing metadata models and dictionaries, Thom Shepard compiled a metadata glossary to assist public broadcasters in using and applying a common set of terms and definitions. The PDF document contains numerous links to associated web sites. [quoting from the introduction to the article] The rapid changes in the means of information access occasioned by the emergence of the World Wide Web have spawned an upheaval in the means of describing and managing information resources. Metadata is a primary tool in this work, and an important link in the value chain of knowledge economies. Yet there is much confusion about how metadata should be integrated into information systems. How is it to be created or extended? Who will manage it? How can it be used and exchanged? Whence comes its authority? Can different metadata standards be used together in a given environment? These and related questions motivate this paper. During the 2001 Iowa DTV Symposium "Covering Our Assets" session, CPB's Alison White emphasized the critical importance of Asset Management in tomorrow's digital content production, exchange and delivery. The September 2001 meeting of the International Broadcasting Convention in Amsterdam, Netherlands, included an all-day session of 12 presentations regarding Metadata for Broadcast and New Media. In association with SMPTE, the presentations were divided into two topical areas: (1) Metadata in Action, and (2) Metadata History, Standards and Implementation. The following HTML link outlines the agenda of the presenters and contains links to Adobe Acrobat PDF versions of the PowerPoint slides. Steven Vedro's article "Why Metadata Matters," originally published in Current, surveys metadata research and standards-making and explains why we must all understand this (formerly) esoteric field. The International Federation of Library Associations and Institutions (IFLA) engaged a study in the late 1990s to produce a framework that would provide a clear, precisely stated, and commonly shared understanding of what it is that a library bibliographic record aims to provide information about, and what it is that we expect the record to achieve in terms of answering user needs. The study also recommended a basic level of functionality and basic data requirements for records created by national bibliographic agencies. "Metadata: Why Should We Care?" Handling and Shipping of Magnetic Recording Tape"